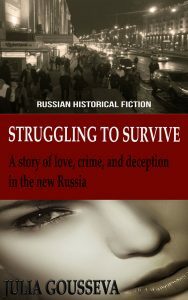 Anya’s Story and Struggling to Survive is a two-book Russian historical fiction series. The story starts during the turbulent time of the collapse of the Soviet Union and continues into the turmoil of the first years of life in the new Russia. The story of Anya’s life, with its loves and tragedies, plays out against the background of the Gorbachev years and the collapse of communism. The disintegration of the old comfortable Soviet system is mirrored perfectly in Anya’s own experiences as her sense of security is threatened, both by the precariousness of everyday existence in a crumbling state and by the shocks in her own love life. Anya, a 17-year-old high school graduate, can’t wait to marry her high school sweetheart and have a secure and stable life with him. Even when Russia is thrown into political turmoil and economic hardships, from food shortages and long grocery lines to exorbitant prices and late-night monetary reforms, Anya believes that love will persevere. Then, life takes an unexpected turn, and Anya experiences deceit, betrayal, and humiliation from the person closest to her. As Anya struggles to regain control of her life, she finds herself in a small northern town on a Soviet submarine base where she faces new challenges she could not have imagined. What happens in that town tests Anya’s passion for life, her ability to love, and changes who she is in fundamental ways, as fundamental as the changes in Russia itself. Still shaken by her husband’s tragic death in a submarine accident, Anya returns to Moscow, hoping that the familiar environment and Babushka’a love will help her overcome grief. But nothing about Moscow is familiar to Anya. 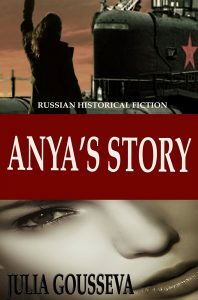 Drastic social and political changes had occurred while she was away, and Russia seems like a foreign country to Anya. Gone is the old Soviet life, drab but comfortable, with its dimly-lit streets, state-sponsored stores, and hand-me-downs clothes. Now, life is all about glitter, glamour, and money. Anya feels out of place and desperately poor. She turns to her best friend Katia for help, willing to do anything and try anything to provide for her baby daughter. Katia’s ideas sound drastic and, at first, Anya is hesitant to take Katia’s advice but her options are severely limited. Without a stable income or hope for a better future, Anya is forced to make choices that are becoming more and more dangerous.